636H-RL is Chromic Gut suture made by Ethicon, a Johnson & Johnson Company. 636H-RL features 3-0 thread size and FS-2 Reverse Cutting needle. This is a 3/8 Circle needle, 19mm in size. 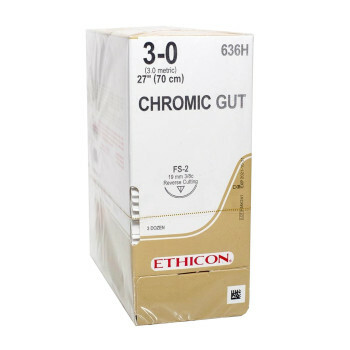 This Ethicon Chromic Gut suture is 27" long and is packaged 36 to a box. Med-Vet International is proud to offer this Ethicon Chromic Gut suture 636H-RL at the most competitive price.